Browse: Home / Snow Day!! I peeked out the door this morning to see what the forecast of snow had given us and was amazed by a quiet, beautiful snowscape. After about 20 min of bundling the kids and myself up in warm clothes we went out to enjoy the weather! 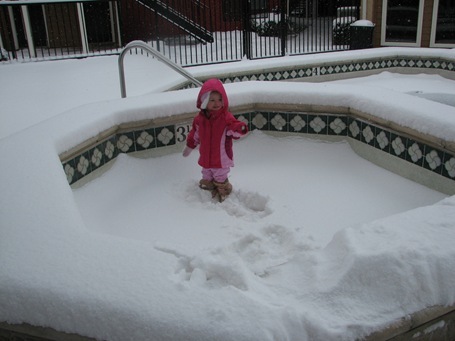 (Flora stayed inside with Daddy for those of you that wondered). 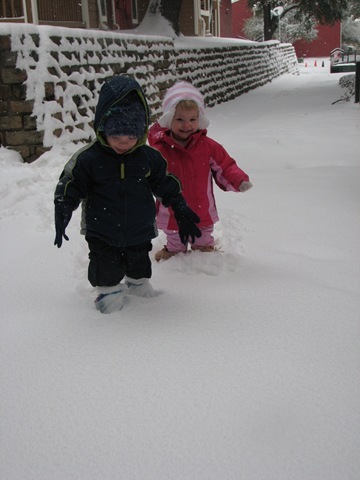 I carried the kids down the steps, set them in the snow and stepped back to see what they would do…. 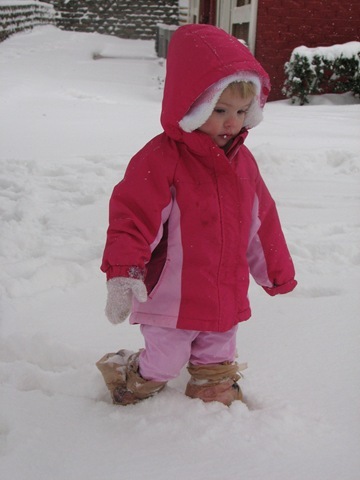 Ivy was a little snow mobile – no help needed here! Notice the plastic bags around the feet to keep the snow out? I’ll bet that increased our outside time by 10 min! Lance loves the idea of snow but the actuality is a bit more than he cared to face by himself. 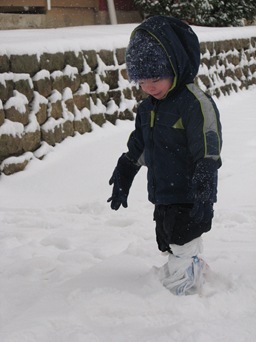 Perhaps he was remembering the slippery ice of the last few days. 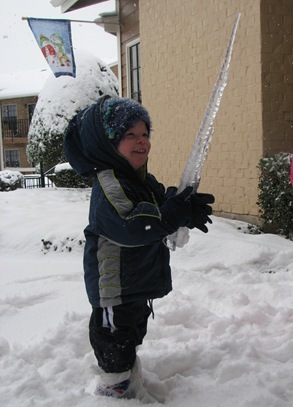 He loved the icicles though – I think that one is as big as he is! 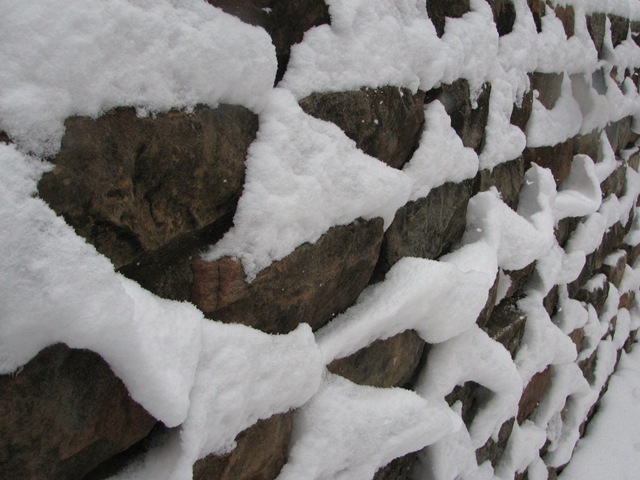 I loved the snow on the rock wall! This reminded me of something you would only see up north! It’s funny, the pool was frozen over yesterday and I watched some of the apt. complex staff take their pictures standing on the edge of the ice. 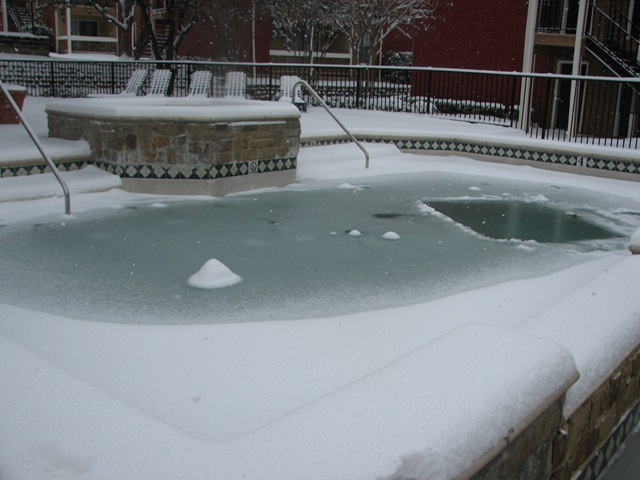 I wanted to do the same today but everything had turned slushy even though the temps had stayed cold. 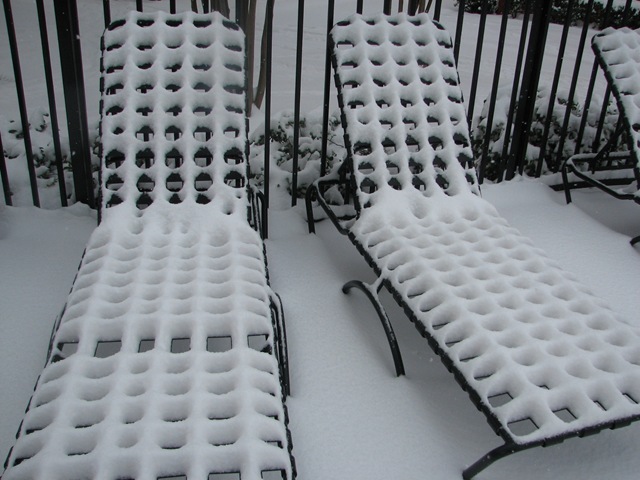 And this picture is just because I thought the pattern was really cool. No snow sculptures because it’s so cold the snow is powdery and not wet enough to stick together. There’s a dad and his kids outside right now trying to build a snowman and it probably took the 30 min to pack two balls together for a two foot snowman. 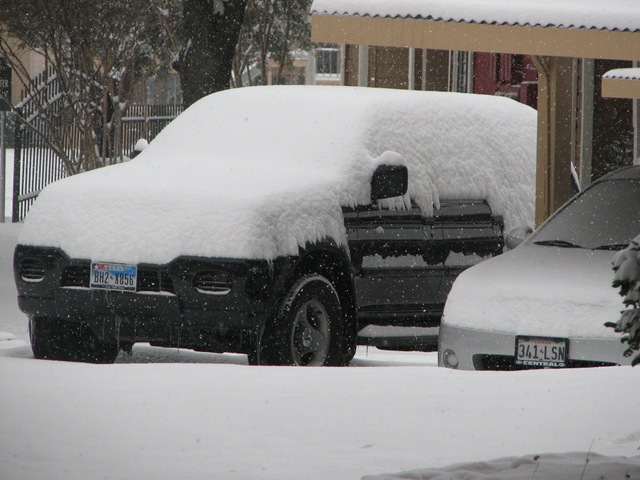 Maybe I’ll take the kids out to admire it in a little while…. Jenny stopped eating when she heard the video.